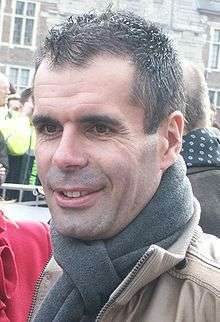 Peter van Petegem (born 18 January 1970 in Brakel, Belgium) is a former professional road racing cyclist. Van Petegem last rode for Quick Step-Innergetic, in 2007. He lived in Horebeke. He was a specialist in spring classics, one of ten riders to win the Tour of Flanders and Paris–Roubaix in the same season. His last race was the GP Briek Schotte in Desselgem on 11 September 2007.